Our dear friend and blues inductee, Dorothy Ellis passed this evening and in memory we wanted to share a great article from the Oklahoma Gazette from March 2017. She was a great friend and wonderful performer. Miss Blues thank you for great memories and good times. 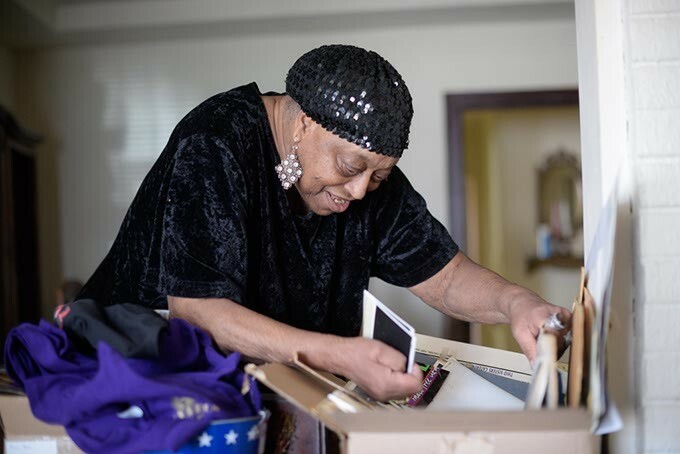 Dorothy Ellis’ house has been mostly scrubbed of its historic treasures, or so she says. Around the northeast Oklahoma City home, there are hardly any photographs of her from more than 15 years ago, an odd omission considering the 81-year-old will celebrate 75 years as a professional musician in 2018. Still, less obvious relics remain scattered throughout the various corners of the house. Near the front door is an autographed poster from Blinddog Smokin’, the Grammy-nominated funk band that scored Ellis her first record deal. Her 2011 Oklahoma Jazz Hall of Fame induction plaque is prominently propped up on a chair in the living room. Near her computer is a photo of her smiling and holding up a setlist autographed by B.B. King after she opened for the global blues icon. Music is still very much in the foreground of Ellis’ life. Miss Blues occasionally performs on Saturday nights at Jazmo’z Bourbon St. Cafe, 100 E. California Ave., and at festivals like the Mayor’s Blues Ball at Medicine Park and Dusk Til Dawn Music Festival in Rentiesville. She achieved some of her greatest prominence as a singer in the Rockin’ Aces, a 1950s and ’60s blues band that included her husband Johnny B on piano, future state Blues Hall of Famer Little Eddie Taylor on guitar and D.C. Minner, who was a bassist in Rockin’ Aces before he became a cherished blues guitarist playing with acts like Chuck Berry and Bo Diddley. “I knew D.C. when he couldn’t play crap,” Ellis said during a recent interview with Oklahoma Gazette. Those standing on the Red River’s north bank about 13 miles straight south of Boswell can peer over into Direct, Texas, Ellis’ tiny hometown. Just a few dozen people currently reside in the rural agricultural outpost. The nearest town of note is Paris, Texas, about a 30-minute drive down Texas State Highway 79. In Ellis’ childhood, hell just seemed a few degrees removed from chopping cotton in the miserable summer sun or picking it in the stinging cold of fall and winter. She was born on the Texas sharecropping cotton plantation where her mother worked. As soon as Ellis was old enough — about 5 or 6 — she was outside working the fields, too. This was the type of environment from which blues music — an originally African-American style often characterized by woebegone lyrics with gospel and field chant influences — first emerged. Similarly, these conditions are what emboldened the music in Ellis’ young mind. Her mother was always singing around the house. One of the first songs Ellis remembers hearing her sing was “Good Morning Blues,” a song made famous by early 20th-century country blues performer Lead Belly. She earned the moniker Little Miss Blues out in the cotton fields from the other workers, who always heard Ellis mimic her mother’s soulful shouts. Ellis’ first paid performance was as a 6-year-old on Easter Sunday at a juke joint on nearby Goss Farm, another cotton plantation. Though it was a club for adults, Ellis said they did not care if children came in to hang out or perform. Ellis sang her trademark “Good Morning Blues” and earned $2.50, the collective change of those in the juke joint that night. The thrill of getting paid to perform was unlike anything she’d felt before. “Let me tell you, I was hooked,” she said. Soon after, on New Year’s Day, Ellis ran away from her caretaker’s house to a shelter for homeless families in nearby Paris. It was a decent existence, but Ellis sought a life outside the shelter walls. One day, she decided to grab the little money she had and walk to the bus station, asking the bus driver how far her savings could take her. “He said, ‘That’ll take you to Oklahoma.’ So that’s how I ended up here,” she said. Ellis settled in an OKC home for girls and, when she was old enough, went to work in its serving quarters. She dropped the “Little” part of her Miss Blues moniker, but she never gave up performing and gradually carved a musical niche for herself. In the early ’50s, she formed Rockin’ Aces with her husband John. Not long after, John invited in Minner, a Korean War Army veteran he met while working at the city’s Veterans Administration center. Selby Minner owns and operates the D.C. Minner Museum and Oklahoma Blues Hall of Fame in Rentiesville, about 20 miles southwest of Muskogee. (Ellis was a Blues Hall of Fame inductee in 2004.) D.C. Minner eventually left the Rockin’ Aces, picked up the guitar and began touring across the West Coast with Selby, a bassist. 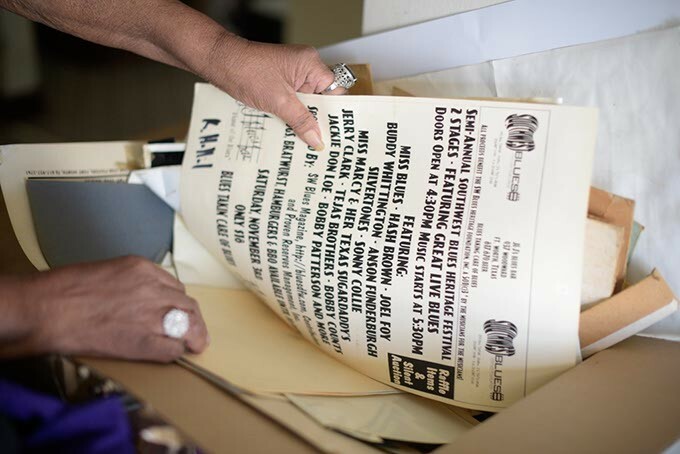 Ellis took her Miss Blues brand through several band lineups over the decades. Jazz and blues music enjoyed OKC heydays between the ’50s and ’70s. The two scenes were tightly associated, Minner said. In other markets, jazz performers mostly stuck with college crowds while blues players dominated bar scenes. In Oklahoma, musicians often played together and floated freely between styles. But, as was the case elsewhere in the country, those genres eventually fell out of rotation. Many of the city’s popular clubs began to disappear. Ellis, in all her success, never left Oklahoma. She didn’t even record her first album until 2008 because she thought it was too expensive. It wasn’t until members of Blinddog Smokin’ caught one of her live shows and offered to pay for her studio time that she produced her first CD. 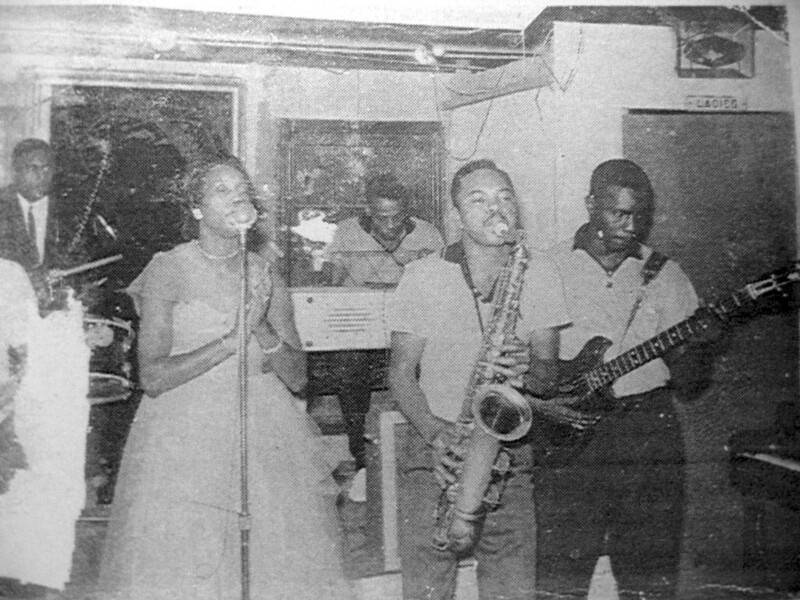 Many in the state’s jazz and blues scenes came up during the music’s golden era and are around Ellis’ age. John is the inspiration behind many of Ellis’ original songs, but as is appropriate for the blues, rarely in a glowing or romantic way. Ellis even admits their relationship was more brother-sister than that of destined lovers. Ellis said she had to be revived from death three times in 2014 while hospital-bound with pneumonia. Her stay lasted months, and when she returned home, she discovered her house had been burglarized. Thieves stole jewelry, a drawer full of coins and even historic photos from Ellis’ performing career. She didn’t let the setback break her. Music, as always, helped push her forward. She played her first gig back just one week after her release from the hospital. She sang with an oxygen tube running into her nose.